I may have to change my mind. When asked a few years ago to pick which department in Washington most deserved to be eliminated, I chose the Department of Housing and Urban Development. And HUD unquestionably is a cesspool of waste, so it certainly should be shuttered. But the more I read about the bizarre handouts and subsidies showered on big agribusiness producers by the Department of Agriculture, the more I think there’s a very compelling argument that it should be at top of my list. Indeed, these giveaways are so disgusting and corrupt that not only should the department be abolished, but the headquarters should be razed and then the ground should be covered by a foot of salt to make sure nothing ever springs back to life. That’s a bit of hyperbole, I realize, but you’ll hopefully feel the same way after today. That’s because we’re going to look at a few examples of the bad results caused by government intervention. To get an idea of the Soviet-style nonsense of American agricultural programs, a Reuters report on the peanut programs reveals how subsidies and intervention are bad news for taxpayers and consumers. Here’s the big picture. 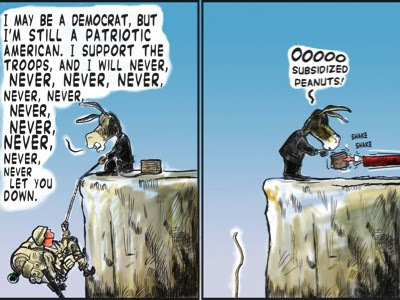 A mountain of peanuts is piling up in the U.S. south, threatening to hand American taxpayers a near $2-billion bailout bill over the next three years, and leaving the government with a big chunk of the crop on its books. …experts say it is the unintended consequence of recent changes in farm policies that create incentives for farmers to keep adding to excess supply. And here’s a description of the perverse and contradictory interventions that have been created in Washington. First, the U.S. Department of Agriculture (USDA) is paying farmers most of the difference between the “reference price” of $535 per ton (26.75 cents per lb) and market prices, now below $400 per ton. A Nov. 18 report to Congress estimates such payments this year for peanuts exceed those for corn and soybeans by more than $100 per acre. Secondly, government loan guarantees mean once prices fall below levels used to value their crops as collateral, farmers have an incentive to default on the loans and hand over the peanuts to the USDA rather than sell them to make the payments. Gee, what a nice scam. Uncle Sam tells these farmers welfare recipients that they can take out loans and then not pay back the money if peanut prices aren’t at some arbitrary level decided by the commissars politicians and bureaucrats in Washington. In other words, assuming the peanut lobbyists have cleverly worked the system (and unfortunately they have), it’s a license to steal money from the general population by over-producing peanuts. And we’re talking a lot of peanuts. Through forfeitures, the USDA amassed 145,000 tons of peanuts from last year’s crop, its largest stockpile in at least nine years, according to data compiled by Reuters. …That stockpile is enough to satisfy the average annual consumption of over 20 million Americans – more than the population of Florida – and puts the administration in a bind. 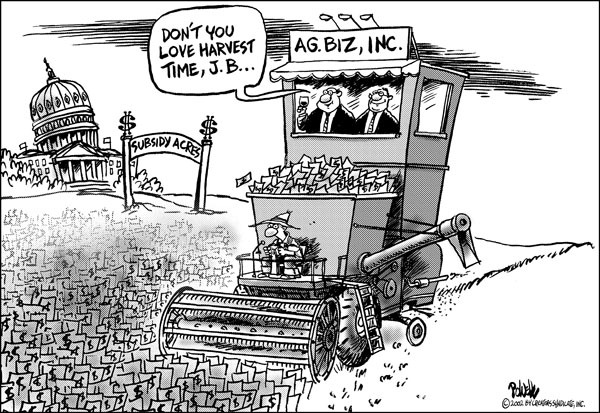 …As peanut carryover inventories are forecast to hit a record of 1.4 million tons by end-July 2016 and as loans begin to come due next summer, farmers are expected to fork over more peanuts to the USDA. Moreover, because the perverse interaction of the various handouts, there’s no solution (other than…gasp!…allowing a free market to operate). Storing the peanuts in shellers’ and growers’ warehouses comes at a cost. Selling them could depress the market further and in turn would add to the price subsidy bill. Now let’s shift gears and look at another sleazy and corrupt example of agricultural welfare. The Des Moines Register is reporting that corn growers and other beneficiaries of the ethanol program are working to cement their place at the public trough. Iowa’s billion-dollar ethanol industry is turning up the heat… America’s Renewable Future, a bipartisan political group backed by top Iowa elected officials and people in agriculture and the ethanol industry, is in the midst of a million-dollar ad campaign to exert pressure on candidates ahead of the Iowa caucuses, supporting candidates who back the Renewable Fuel Standard and criticizing those who denounce it. 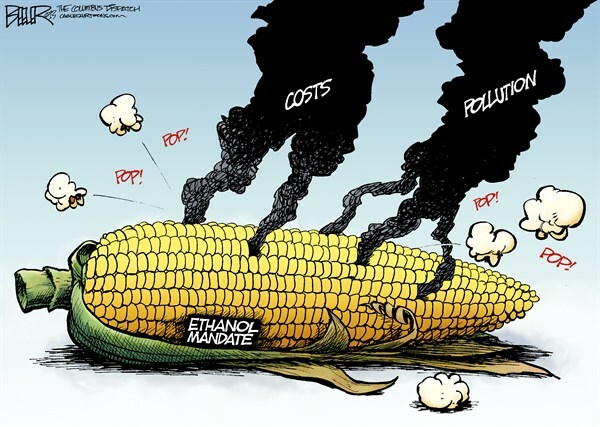 Ethanol is a particularly evil handout, encompassing regulatory mandates, special tax preferences, trade barriers, and other forms of subsidies. And to maintain the flow of undeserved loot, the moochers are applying pressure. Patty Judge, co-chair of America’s Renewable Future and a former Iowa agriculture secretary, said the group has signed up 45,000 people who have pledged to look closely at how the candidates stand on the Renewable Fuel Standard when they vote in the Iowa caucuses. …Iowa is the nation’s largest ethanol producer, churning out 3.9 billion gallons in 2014. While the stories about peanuts and ethanol make for grim reading, now it’s time to get really depressed. That’s because we’re going to take a look at a New York Times story on how Washington is dealing with ag subsidies. In April, Republicans newly in control of Congress celebrated their agreement on a plan to save $5 trillion — that’s trillion, with a “T” — and balance the budget in a decade. …Yet as the year closes, Congress instead is planning to repeal one of the few spending cuts it has passed into law since approving that budget resolution: $3 billion over a decade from subsidies for crop insurers. …Republican leaders agreed to hold a vote next month to delete the savings after lawmakers from agricultural states complained…the agriculture committees, like most others, had no intention of turning budget-balancing numbers into policy reality by voting for cuts that would anger constituents, contributors and influential interest groups — not the $20 billion that the budget resolution recommended, nor even the $3 billion reduction from crop insurers, a cut that administration officials and Republican leaders tucked into the bipartisan budget deal Congress passed in October. By the way, to get further depressed, this means that the terrible agreement to bust the spending caps just became even worse. So now you’ll understand why the Department of Agriculture deserves to be eliminated. P.S. You probably won’t be surprised to learn that the disgraced and convicted former House Speaker, Denny Hastert, had his filthy hands in the ethanol business. P.P.S. And don’t forget that the wasteful food stamp program is part of the Department of Agriculture, largely to create an unholy alliance of rural moochers and urban moochers. P.P.P.S. Last but not least, the clowns in Washington not only muck up how food is produced, they also can’t resist interfering in how food is consumed. Oh shoot, I could of told you what a waste the USDA is years ago! Subsidies aside, they spend millions counting dog turds in a pen and still let the American public get food poisoning from import and domestic produce. The hateful EPA should be first on the list of departments to be abolished. Moreover, all legislation enacted since its inception – and the inception of similar departments created by the states – should be forthwith repealed.